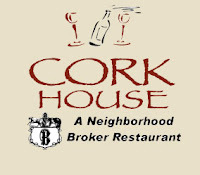 The Cork House Wine Restaurant is owned by the same two gentlemen who own the Broker Restaurant.- Ed Novak and Jerry Fritzler. They are honored to be part of the Colfax business community. This relaxed wine bar is most proud of its affordability, and is a direct invitation from the owners to "Come for the Wine, Stay for the Food." 1. Tell our readers a bit about who you are and what you do. My name is Sarah Bourgoin. I am currently the General Manager of the Cork House Wine Restaurant. I grew up in a neighborhood restaurant in Maine and came here eleven years ago with a burning desire to work for a company with a substantial history of guest satisfaction. Sheer luck led me to interview with The Broker Restaurants, and I have been with them ever since. My job here involves day to day operations as well as community relationships. 2. What is The Cork House all about and where is it located? The Cork House is the culmination of a dream for Jerry Fritzler, our managing partner, to bring to Denver the casual flavor and atmosphere of Napa, which in many ways reflects the best of provincial style wine drinking in Europe. Our address is 4900 East Colfax. We are nine blocks east of Colorado Boulevard at Eudora. Our community is the exact corridor between the Mayfair and Park Hill. 3. Why should our readers dine at The Cork House? While our guests come for many different reasons, they choose The Cork House for its incredibly value priced wine and cheese selections. We genuinely wish you to come in to relax. 4. What is the Cork Club? The Cork Club is our zany inner circle of wine enthusiasts who regularly participate in monthly wine dinners and tastings. This club is amazingly self motivated. I act as their "Secretary of Fun" by keeping them up to date on the events and using their requests for future bookings. Anyone can join-just go to our website. We gain almost two new members every day! 5. What is your favorite menu item and wine list pairing and why? I have deferred to Jerry Fritzler (AKA- The Boss)on this question. He is our expert purchaser and used to teach the food and wine pairing graduate course at thje University of Denver. His favorite menu item is the Eggplant Napolean, a richly layered entrée with varying Mediterranean textures and flavors. He prefers it paired with any of the Malbecs or Syrahs on his list. When I tried to pin him down to one, he explained that the joy of the selection was actually in the individual palate. He encourages you to try any of the wines that he has opened by the glass before making your purchase.He prefers the Malbec because of its spice, fruit, and savory tannins. 6. Are there any specials or events coming up for the winter holidays? The Cork Club has elected to put on a "Holiday Sparkling" event the second week of November to kick off the season. The Cork House will be serving a very special brunch for Thanksgiving from 10 AM to 3 PM. Please call me (303-355-4488) or e-mail me(events1@corkhousedenver.com) for more information. Our most popular regular event is our Half Price OFF every single bottle of wine on Thursdays. 7. What is the history of the Cork House building/location? By far, one of my favorite things about the Cork House is the historical restaurant property that it occupies. This was the site of the original Normandie which was opened by Chef Pierre Wolfe, one of Denver's most respected chef owners. He sold the parcel to Corbin (Corkie) Douglas who expanded as Tante Louise. For over thirty years she was the one of the most important French restaurants in the hearts and minds of Coloradoans. Talk about big shoes to fill! The story is that when Corkie was ready to retire, he called one of his good friends and fellow restaurauteur, Ed Novak (The Broker Restaurants, The Egg & I) and asked him if he would be interested in acquiring the property. The rest is history. To honor Corkie and in tribute to their vision, The Cork House was born. My opinion is that these dining rooms are a legacy. These buildings are a living history of culinary culture in our city, on our Avenue, and in our neighborhood. Who knows where else we can go? 8. Do you know any interesting stories of famous visitors or past residents? I defer once again to the Boss for this question. He really enjoys the restaurant professionals who come to visit, and he says that a number of star powered celebrities have been through. Hi absolute favorite, however, are our neighborhood regulars (all prominent Cork Clubbers) - Dave & Megan, Crispin, Dr. Lynn, etc. These lovely people, and so many more, have been our private cheerleaders and pretty much our family since we have opened the doors. I don't know where we would be without them. 9. What is your favorite thing about Colfax Avenue and doing business on Colfax? 10. Do you have any business advice for Colfax Avenue entrepreneurs? I have a direct quote for you here. "Nothing would make me happier than to see a restaurant on every corner of Colfax," Jerry Fritzler. Going back to diversity, he feels that all styles and originations from fast food to fine dining will give a true reflection of who we are. Perhaps it will even establish us a destination - a neighborhood to explore and enjoy. He encourages future business owners to jump right in. The fellowship and support here are second to none. This is the only place I have ever worked where the guests will stop in and say, "How's business? Are you doing OK? We really want to keep you here. This is such a nice place to come." The owners of Geez Loiuse Coffee Shop next door (amazing) have adopted us, and the adorable crew who run The Elm, our neighborhood sports pub, Throw parties here. I like to suggest Solera (Colfax/Grape) for Sunday Brunch. The staff is dynamic and thorough. I would also like to pay tribute to Steve's Snappin Dogs, an East Coast hot dog fix. Guess what? I see THEIR employees out on our patio! In New England we say "Good neighbors build good fences." I would like to change that to "Good neighbors build great places." Here we are, and we owe it all to you.